« Eugene H. Fleming, III: another Hodges Gardens designer? I recently mentioned my interest in a couple of collections at the LSU-Shreveport Archives & Special Collections in northwest Louisiana. The goal was to learn more about the Lambert Landscape Company, which may have played a role in the early development and design of Hodges Gardens. I connected with head archivist Dr. Laura McLemore, and she was kind enough to preview the collections. The materials within don’t appear to hold any clues to further my knowledge of Lambert’s role in Hodges Gardens landscape history, but a document I found yesterday helps bring things into perspective. 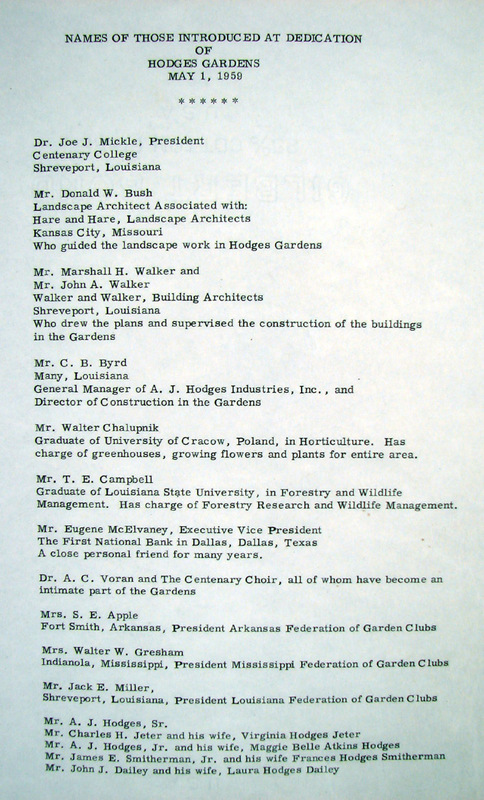 The image below is a photo of the recently found document—a schedule of introductions from the 1959 grand opening at Hodges Gardens. The early historians and archivists at Hodges Gardens did an impressive service to the future understanding of this special place. Today, more than 52 years after the printing of this opening ceremony document, this historic landscape research is benefiting from its being saved. This really speaks to the fact that documents and articles of any type and perspective can be helpful resources in historic landscape research (Hodges Foundation Archive). This document tells me quite a bit. It’s a list of folks who were recognized for their contribution to the creation of Hodges Gardens. Donald Bush of Hare & Hare, Marshall & John of Walker & Walker, and construction manager C.B. Byrd are listed, among others. The Bush/Hare name, however, is the only landscape architect noted. Obviously, Lambert may still have played an important role, and for some reason or another the group just wasn’t recognized at this event. While I know Lambert was associated with A.J. 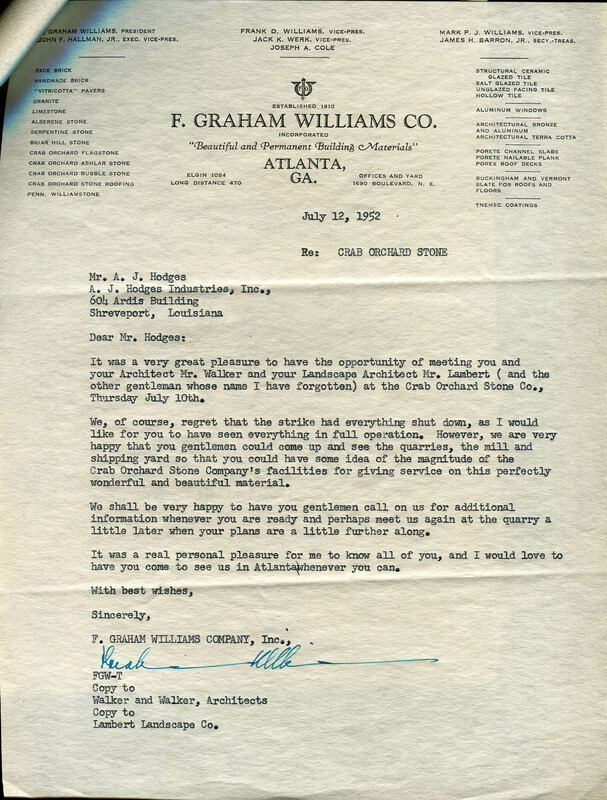 as his landscape architect, thus far I’ve only seen this connection in one document: a letter in which a wholesale supplies company representative thanks A.J. Hodges and “[his] landscape architect Mr. Lambert” for their visit to a Tennessee quarry. In the case of Hodges Gardens, was Lambert primarily serving once or twice as a consultant on construction materials research? It may be a while before I know the answer to this question, but in the meantime, I think it’s time to press forward. There’s more to discover and document—for one, a conclusion I’m forming regarding the Garden’s connection with Eugene H. Fleming, III. For now, Lambert traveled with Hodges to a crab orchard stone quarry in Tennesee (stone of which was not ordered)—beyond that understanding, future research may hold more clarification.